Samboree Tentatively Planned for 2012. Join a Chapter and Have Lots of Fun. Our Chapter was chartered in August,1983. 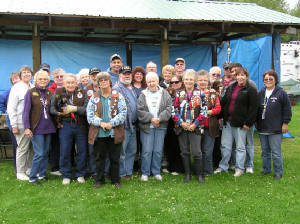 In 2008 Sourdough Sams has over 55 members and over 26 RV's involved in our Chapter Activities. We meet on the second Sunday at members homes in the winter. Our meetings include: a potluck dinner, our meeting, socializing, card & domino games. Winter Meetings. Location Muldoon Manor, 2040 Muldoon, Anchorage, Ak. Potluck starts at 4 p.m.. Please bring a dish to serve six people. Please bring you own plate, silverware and softdrink. During the summer our meetings are held at various campgrounds. Winter Meeting Location Directions. From the Glenn Hy Turn onto Muldoon Rd., Go past Debarr Rd. to the top of the hill. Turn Right at Marlow Manor. Go down the hill to building at the bottom of the hill on the right. 2nd Sunday of the month. Time 4 p.m.
2011 Summer Camping Schedule. (to be posted later. Please come and visit our Chapter. We would love to share some of the fun that we have when camping. For infor call (907)830-6325.
some Alaska fun with us.